There’s certainly been a number of quality movies coming out of Korea in recent years … from the acclaimed films of Park-chan Wook (‘Old Boy’, ‘Sympathy for Mr Vengeance’) to quality horror like ‘I Saw The Devil’. So I thought after enjoying such movies, I’d better seek out some more Korean cinema. So we come to this much talked about take on the 28 Days Later formula of a virus outbreak and a hoard of ‘infected’. This time during a routine train journey. We’re introduced to a businessman (Yoo Gong) going through a messy divorce and trying to retain some sort of relationship with his daughter. However on a train journey to take her back to her mother, said business man and a group of interesting characters soon discover that a virus has broken out and is spreading like wildfire. This is classic stuff, not dissimilar to a disaster movie where the viewer is introduced to a range of personalities each with their own agendas and back stories. However with the threat of a growing number of infected on the train and not knowing if the destination is safe, a battle for survival quickly ensures with tension cranked up to 11. I felt this brought back genuine thrills and intensity to horror that seems to have been missing for a while. It favours heart-in-mouth moments (whenever a window shatters) over gore and has impressive CGI and slick production values throughout. The setting was claustrophobic and made for some genuinely chilling moments and the range of different characters (all well acted, particularly the young girl) made me care for not just the principle leads but almost everyone (bar a particularly selfish guy who you’ll be booing towards the end). It’s the sort of movie that keeps you guessing about who will survive and how things will turn out and for me, made for probably the best movie of the year so far. 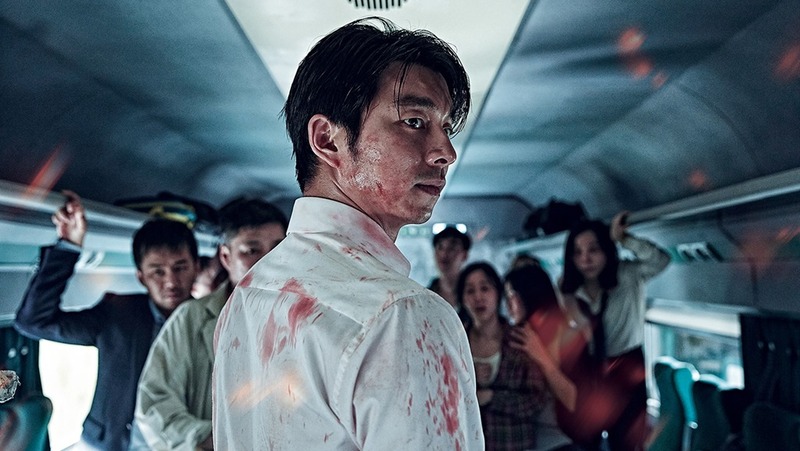 This entry was posted in Blu-Ray, Horror Reviews, Movies, Reviews, Thriller Reviews, World Cinema and tagged infected, Korea, Korean, Outbreak, Sang-ho Yeon, Soo-ann Kim, Train to Busan, Yu-mi Jung, Zombies by Craig M. Bookmark the permalink.